Scottish noir is a booming industry, and the output of the Scots raises some questions about noir in general. 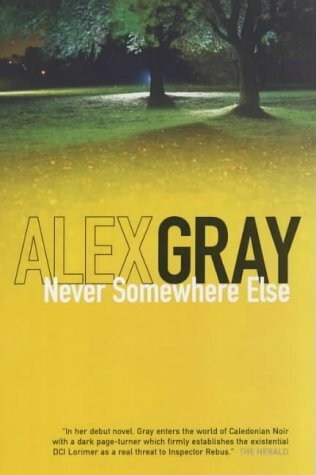 Alex Gray's Never Somewhere Else has all the elements of noir (dark urban setting, lurking danger, etc) but never really adds up as noir: that is to say, it remains a genre mystery whose formula is ultimately one of reconciling rather than unsettling the relation of reader/character/society. Gray's heroes, a paired Chief Inspector and Psychologist/Profiler (a cliched crime-fighting pair that is getting to be annoying in all its manifestations these days), diligently search for the possibly false serial killer (real killer, maybe not real serial killer) but there's never any sense of gloomy social deterioration or even social commentary. Denise Mina's novels are much more in the noir vein, though I find her writing to be a bit overdone and her character (in her Garnethill trilogy) a bit whiny in her repetitive obsessions. But her Garnethill is vastly more thoroughly drawn than the same setting in the plot of Alex Gray's novel. And there is a real sense of the human frailties at the root of urban rot in Mina's novels. 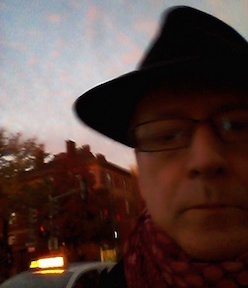 That is the essence of noir, as opposed to mystery or crime fiction per se: a skeptical, even pessimistic, view of the milieu in which the crime takes place. The mystery novels of other Scottish crime writers remain in the non-skeptical, mystery-novel genre (though I do vastly prefer the procedurals of Peter Turnbull--a former social worker, if memory serves me right--rather than the hard-boiled Rebus novels of Ian Rankin, which seem to me too concerned with people in high places to really be noir). For noir dealing with high-rollers, the comic novels of Christopher Brookmyre, particularly the early ones, are much more effective than Rankin, and certainly much more fun, whether they're really noir or not. Brookmyre's Quite Ugly One Morning eventually falls apart somewhat, but the first half (at least) of the novel is very funny in a very dark and violent way.